Chick Lit Central: How Debbie Viggiano celebrates the winter holidays...plus a book giveaway! How Debbie Viggiano celebrates the winter holidays...plus a book giveaway! Debbie Viggiano is 48 years old and a UK published author. She has written all her life but was published for the first time this year. Her debut novel, "Stockings and Cellulite," is a contemporary romance falling within the Chick Lit category. It is a light-hearted humorous story about a 39 year-old mother of two rediscovering life and love again. You can check her out via her website and read a few pages of "Stockings and Cellulite" to give a taster! You can also add her as a friend on Facebook. She has just completed a working draft of her second novel, "Flings and Arrows." She lives with her Italian husband in leafy Swanley Village, England. Together, they have three children and a food-obsessed beagle that believes she is their fourth child. We recently had the opportunity to ask Debbie some holiday-themed questions and enjoyed hearing what she had to say. She offered to give away one copy of "Stockings and Cellulite" to a lucky reader, as well! Favorite winter holiday food: Roast salmon, baby new potatoes and winter vegetables baked with a drizzle of green pesto sauce. Favorite winter holiday song: "Do They Know It's Christmas" by Band Aid...I think the song is about 25 years now but whenever that comes on the radio you can be sure what time of year it is! Favorite winter holiday movie: "Home Alone" with a very young Macaulay Culkin. Good clean family fun. Favorite winter holiday memory: When my grandparents were alive and spending Christmas with us. Now that was magical. Favorite winter holiday gift you've ever received : A ski trip. Aside from writing, my other passion is skiing up and down mountains. Favorite winter holiday gift you've ever given: A trip to Lapland to see Father Christmas when the children were young. Their faces were so incredulous seeing reindeer pulling jingling sleighs and watching elves beavering away in Santa's workshop, I'll never forget it. Thing you're most looking forward to during the winter holidays this year: Well currently I'm housebound from a freak heavy winter snow fall. This country is just not geared to dealing with more than one inch of snow. As we've currently had two feet in 72 hours, the thing I'm most looking forward to is getting out of the house, to the shops and buying a great big fresh green salad with all the trimmings! Thing you wish there would be more of during winter holidays: Daylight. Thing you wish there would be less of during winter holidays: Mince pies. I'm in danger of turning into one! Thanks to Debbie for answering our questions and for offering a book for the giveaway! 1. Please tell us: What is your favorite winter holiday themed movie? 2. Please tell us: What is your favorite winter holiday themed song? Giveaway ends Sunday, December 12th at midnight EST. I wrote a post on my blog about the movies that I love, and I can't choose just one! My favourite is "The Muppet's Christmas Carol" but I also love the animated version of "How The Grinch Stole Christmas", "A Christmas Story", "A Miracle on 34th Street" and "Elf"! Hmmm...song choice is harder for me, but I would say that I like that cute song about wanting a hippopautamus for Christmas the best. I heard it yesterday and cranked it up! This contest is on my sidebar now! How The Grinch Stole Christmas! It's tradition! Mariah Carey, All I Want For Christmas! My favorite song is U2 "Baby please come home"
I just love Polar Express. Have joined Chick Lit Central on Facebook. My favorite holiday themed movie is A Christmas Story! My favorite holiday song is Jingle Bell Rock! My favourite movie is Nightmare Before Christmas. Favourite movie hands-down is Santa Claus: The Movie. But I also really love Muppet Christmas Carol and One Magic Christmas. Favourite holiday song is probably Grown-Up Christmas List. I have loved this song since I first heard Amy Grant's version. It's a 3 way tie. My favorite adult movie is Elf. Elf never gets old, but then again, I am a HUGE Will Ferrell fan. My favorite kid movie is Merry Christmas Charlie Brown. While it isn't a movie per say, it is an integral part of the list of things that need to happen before Christmas. And every Christmas eve before the kids go to bed for Santa to come, we watch The Polar Express. I think that one is my favorite of all three. Already joined Chick Lit Central on Facebook. Just heard A Baby Changes Everything sung by Faith Hill...so beautiful! 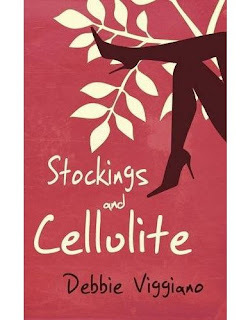 I find the book Stockings and Cellulite quite good.Nice story as the lady rediscover the love and life.Very well written book Debbie.Thanks for sharing your holiday experience with us.This post is wonderful.